Sharing pictures with your family and friends is easier than before. The availability of the internet and the social networking sites today relieves the anxiety of millions of people that far away from their love ones. By sharing their best memories captured by their camera’s and through Facebook and other sites offering picture sharing, you never missed the happenings. If you’re not familiar or don’t know how to upload photos from your PC or Mac just follow the instructions below. Go to your profile, just click your name, see the screenshot. In your profile, click on “Photos” then click “Create Album” to upload your photos, be sure that the photos you want to upload, already available in your PC/Mac. 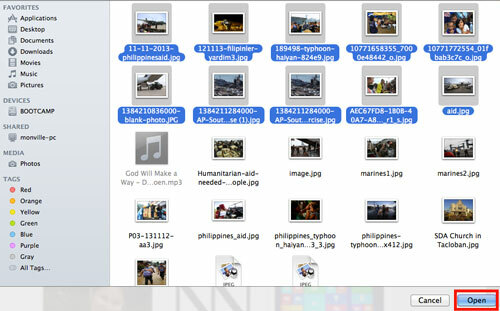 By clicking the create album button, a window will pop up where you are going to select the pictures/photos. You can select multiple photos to save time if you’re going to upload more more than one before clicking the open button. After you click the “Open” button the photos will upload automatically, while uploading, you can type the album name, description, place and date when and where the picture was taken. A. After the upload is complete you can tag the face who’s in the picture, your friends or family will receive a notification if you tag them. B. You can add more Photos if you want. 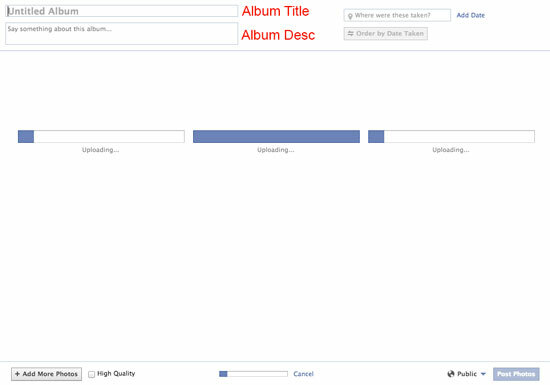 C. You can also decide whether you want your album to be visible to everyone or just your close friends/ family. 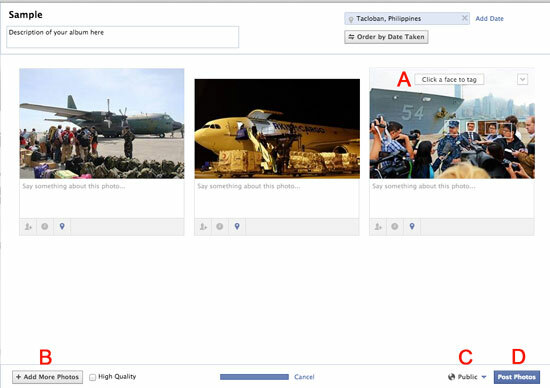 D. Click “Post Photos” button to finish the upload. You can continue tagging all the faces in the album that you uploaded or just skip. It will automatically redirect to the new album you uploaded. On your new album you can share with your friends, add more photos, edit, continue in tagging your friends or even delete, see the screenshot.